The rise of economic inequality is one of the most hotly debated issues today in the US (Furman 2016) and indeed in the world. Yet economists and policymakers alike face important limitations when trying to measure and understand the rise of inequality. What part of the rise in inequality is due to changes in the share of national income that goes to workers (labour income) and owners (capital income) versus changes in how these labour and capital incomes are distributed among individuals? It’s a tale of two countries. For the 117 million US adults in the bottom half of the income distribution, growth has been non-existent for a generation, while at the top of the ladder it has been extraordinarily strong. And this stagnation of national income accruing at the bottom is not due to population ageing. Quite the contrary: for the bottom half of the working-age population (adults below 65), income has actually fallen. In the bottom half of the distribution, only the income of the elderly is rising.5 From 1980 to 2014, for example, none of the growth in per-adult national income went to the bottom 50%, while 32% went to the middle class (defined as adults between the median and the 90th percentile), 68% to the top 10%, and 36% to the top 1%. An economy that fails to deliver growth for half of its people for an entire generation is bound to generate discontent with the status quo and a rejection of establishment politics. 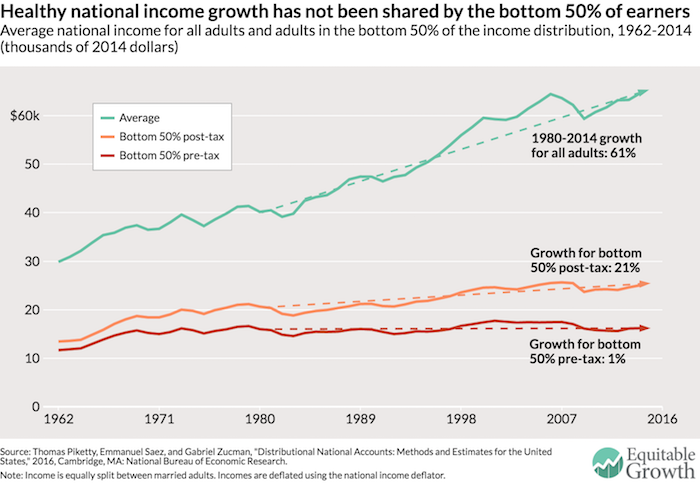 Because the pre-tax incomes of the bottom 50% stagnated while average national income per adult grew, the share of national income earned by the bottom 50% collapsed from 20% in 1980 to 12.5% in 2014. Over the same period, the share of incomes going to the top 1% surged from 10.7% in 1980 to 20.2% in 2014.6 As shown in Figure 2, these two income groups basically switched their income shares, with about 8 points of national income transferred from the bottom 50% to the top 1%. The gains made by the 1% would be large enough to fully compensate for the loss of the bottom 50%, a group 50 times larger. To understand how unequal the US is today, consider the following fact. In 1980, adults in the top 1% earned on average 27 times more than bottom 50% of adults. Today they earn 81 times more. This ratio of 1 to 81 is similar to the gap between the average income in the US and the average income in the world’s poorest countries, among them the war-torn Democratic Republic of Congo, Central African Republic, and Burundi. Another alarming trend evident in this data is that the increase in income concentration at the top in the US over the past 15 years is due to a boom in capital income. It looks like the working rich who drove the upsurge in income concentration in the 1980s and 1990s are either retiring to live off their capital income or passing their fortunes onto heirs. Our second main finding is that government redistribution has offset only a small fraction of the increase in pre-tax inequality. As shown in Figure 1, the average post-tax income of the bottom 50% of adults increased by only 21% between 1980 and 2014, much less than average national income. This meagre increase comes with two important limits. First, there was almost no growth in real (inflation-adjusted) incomes after taxes and transfers for the bottom 50% of working-age adults over this period because even as government transfers increased overall, they went largely to the elderly and the middle class. Second, the small rise of the average post-tax income of the bottom 50% of income earners comes entirely from in-kind health transfers and public goods spending. The disposable post-tax income – including only cash transfers – of the bottom 50% stagnated at about $16,000. For the bottom 50%, post-tax disposable income and pre-tax income are similar – this group pays roughly as much in taxes as it receives in cash transfers. Third, an advantage of our new series is that it allows us to directly compare income across countries. Our long-term goal is to create distributional national accounts for as many countries as possible; all the results will be made available online on the World Wealth and Income Database . 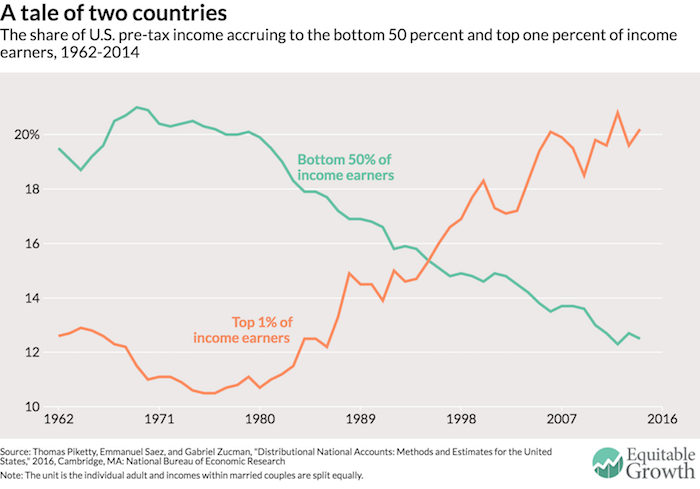 One example of the value of these efforts is to compare the average bottom 50% pre-tax incomes in the US and France.7 In sharp contrast with the US, in France the bottom 50% of real (inflation-adjusted) pre-tax incomes grew by 32% from 1980 to 2014, at approximately the same rate as national income per adult. 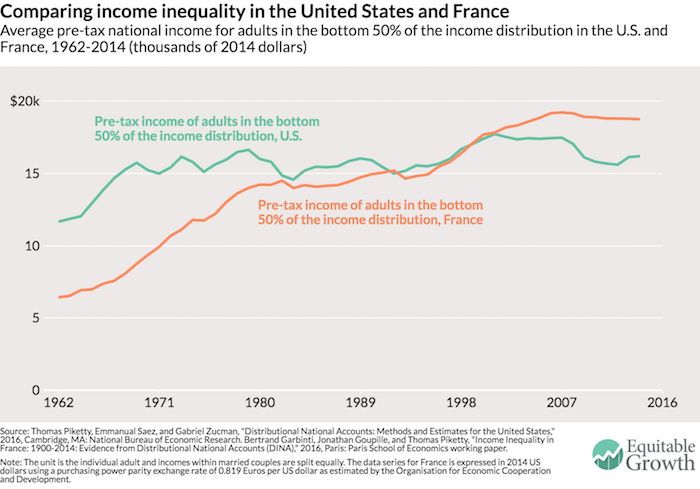 While the bottom 50% of incomes were 11% lower in France than in the US in 1980, they are now 16% higher (see Figure 3). The bottom 50% of income earners makes more in France than in the US even though average income per adult is still 35% lower in France than in the US (partly due to differences in standard working hours in the two countries).8 Since the welfare state is more generous in France, the gap between the bottom 50% of income earners in France and the US would be even greater after taxes and transfers. The diverging trends in the distribution of pre-tax income across France and the US – two advanced economies subject to the same forces of technological progress and globalisation – show that working-class incomes are not bound to stagnate in Western countries. In the US, the stagnation of bottom 50% of incomes and the upsurge in the top 1% coincided with drastically reduced progressive taxation, widespread deregulation of industries and services (particularly the financial services industry), weakened unions, and an eroding minimum wage. Steeply progressive taxation that affects the determination of pay and salaries and the pre-tax distribution of income, particularly at the top end. The different levels of government in the US today obviously have the power to make income distribution more unequal, but they also have the power to make economic growth in the US more equitable again. Potentially pro-growth economic policies should always be discussed alongside their consequences for the distribution of national income and concrete ways to mitigate their unequalising effects. We hope that the distributional national accounts we present today can prove to be useful for such policy evaluations. We will post online our complete distributional national accounts micro-data. These micro-files make it possible for researchers, journalists, policymakers, and any interested user to compute a wide array of distributional statistics – income, wealth, taxes paid and transfers received by age, gender, marital status, and other measures – and to simulate the distributional consequences of tax and transfer reforms in the US. Editors’ note: This column first appeared on the Washington Center for Equitable Growth website . Reproduced with permission. Furman, J (2016), “Forms and sources of inequality in the United States ”, VoxEU.org, 17 March. Garbinti, B, J Goupille and T Piketty (2016), “Inequality Dynamics in France, 1900-2014: Evidence from Distributional National Accounts (DINA),” Paris School of Economics working paper. Piketty, T and E Saez (2003), “Income Inequality in the United States, 1913-1998,” Quarterly Journal of Economics, 118(1), 1-39. Piketty, T, E Saez, and G Zucman (2016), “Distributional National Accounts: Methods and Estimates for the United States ”, NBER Working Paper 22945. U.S. Congressional Budget Office (2016), “The Distribution of Household Income and Federal Taxes, 2013”, Washington, DC. 1 Many important forms of income, such as fringe benefits of employees, retained profits and taxes paid by corporations, or imputed rent of homeowners, are part of U.S. national income but are not included in individual survey or tax data. 2 Official U.S. Census Bureau household income statistics are based on money income. Money income does not subtract individual taxes but adds back cash (but not in-kind) transfers. Hence, it is a mixed concept in between pre-tax and post-tax. It is conceptually sounder to focus separately on pre-tax and post-tax income. The U.S. Congressional Budget Office evaluates the federal tax burden by income groups but does not factor in state and local taxes (U.S. Congressional Budget Office 2016) and does not try to assign the benefits of federal government spending back to individuals. 3 income is GDP minus capital depreciation plus net income received from abroad. Capital depreciation is not income and income from abroad is important, particularly among top earners. 4 All our data are expressed in constant 2014 dollars, using the national income deflator. 5 Our pre-tax income series are based on income after the operation of private and public pensions so that pension and social security income is included in pre-tax income (and the corresponding contributions are deducted). We also estimate series for factor income (before the operation of pension systems). Factor income series also display stagnation of bottom 50% of incomes since 1980. We prefer using pre-tax income series which give the elderly reasonable incomes so that aging has little impact on our inequality series. 6 This 9.5 point increase in the top 1% of the pre-tax US national income share is similar in magnitude to the increase estimated in the Piketty-Saez series, where the top 1% income share (when including realised capital gains) increases by 11.4 points from 10% in 1980 to 21.4% in 2014. The Piketty-Saez series are based on a fiscal income concept, which captures only about two-thirds of total national income, and they use the family tax unit instead of the adult unit (see Piketty and Saez 2003). 7 The results for France are presented in Garbinti et al. (2016). 8 In these calculations, we apply the 2014 purchasing power parity exchange rate of 0.819 euros per US dollar estimated by the OECD.